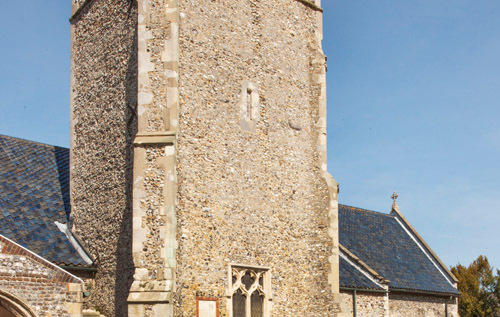 Following the news that St Mary’s Reepham had been awarded a grant from the Heritage Lottery Fund, builders have started to repair the church tower and the remaining fragment of All Saints Hackford, and to repair and attend to the floor of the north aisle of St Mary’s. As a result, 13 small oak-ended pews from this aisle had to be disposed of by the end of September. These were quickly snapped up, mostly by local people who have had personal contact with the church; ; all the pews are now sold. As a result, the Repair and Renewal Fund of St Mary’s received a total of £2,275, which will contribute toward the constant building repairs necessary to the Grade I-listed building, which is still in daily use. Sue Page, Lay Minister, Reepham Church, and vice chairman of the Parochial Church Council, said: “We will miss the pews, but will have gained a new floor, space for exhibitions, and more space for children’s activities and movement in worship. “The project was provoked by a building inspection, which revealed the north aisle floor to be dangerously in need of repair. After much discussion, the church finally agreed to use the space creatively and dispose of the pews. Some of the money obtained from the sale of the pews will also go towards the remaining sum needed to highlight the outline of All Saints in an appropriate and attractive style as part of Reepham Three Churches Project.